WHERE: March at 24th and York at 2pm. Rally at 16th Street/Mission at 3pm. Festival until 6pm. WHY: The Plaza 16 Coalition formed last year to oppose Maximus Real Estate Partners’ proposed 350-unit, 10-story luxury development for 16th and Mission. On the anniversary of last year’s Our Mission No Eviction march, Plaza 16 and Our Mission No Eviction will join together in a unified march across the Mission with a unified message: “the Mission District needs truly affordable housing and neighborhood-serving businesses, not more luxury towers.” See event flier for more info and demands. Hundreds of residents, businesses, and community orgs to demand that the City reject Maximus Real Estate Partners’ controversial 10-story luxury development. 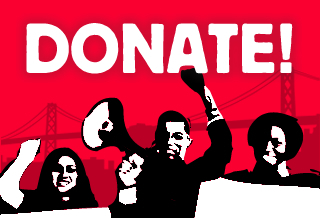 Hundreds of participants will march across the Mission District from 24th and York Street to the 16th and Mission BART Plaza in an event organized by Plaza 16 Coalition and Our Mission No Eviction. They will demand affordable housing for the Mission and demand that the City reject the 10-story luxury development proposed by Maximus Real Estate Partners for 1979 Mission Street at 16th Street. The march–complete with Aztec dancers, Latin All-Star Band, and samba marching band–will end at the BART Plaza where community members will hold a rally with community speakers and a colorful 3-hour festival of live music and art from Mission-based musicians (BAYONICS, ORQUESTA ADELANTE) and artists, as well as food and family activities. “As a neighbor and Marshall School parent I can tell you there is broad opposition to this project in the community. We know it would greatly accelerate gentrification in the neighborhood and have a devastating impact of displacement on our communities of color, low income and working class residents, and local small businesses,” said Beatriz Gudino, a lifelong resident of the 16th/Mission neighborhood. WHO: The event is co-organized by Plaza 16 Coalition and Our Mission No Eviction. Together they are comprised of nearly one hundred community organizations, labor groups, and local businesses; and more than 1,500 residents from the Mission District and across San Francisco. See Plaza16.org for more info on the coalition and for a full list of endorsers. Musical acts include BAYONICS, ORQUESTA ADELANTE, LOCO BLOCO, a MISSION LATIN ALL-STAR BAND and special guests. Participating artists include Michael Rios, Encantada Gallery, reclaimdisrupt.org, senseofplace LAB, and more. “This event will be a beautiful celebration of our community and a loud-and-clear rejection of more luxury development until the neighborhood’s affordable housing needs are met,“ said Oscar Grande, Community Organizer with Plaza16 Coalition member, PODER.